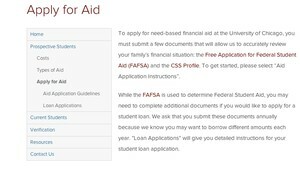 The old page on the University's website for students applying for financial aid. This screenshot was posted on the House's Committee on Oversight and Government Reform website. The University was among 111 schools red-flagged by the Democratic staff of the House Committee on Oversight and Government Reform earlier this month for allegedly violating parts of the Higher Education Act. In response, the Office of College Admissions has clarified the financial aid application policies listed on its website. According to Representative Elijah Cummings (D-MD), the Committee’s ranking member, the Higher Education Act prohibits the use of forms other than the Free Application for Federal Student Aid (FAFSA) when determining eligibility for federal aid. The University of Chicago, along with many other institutions, utilizes the CSS Profile form, which requires additional information and an application fee. “Schools may be contravening the requirements of the Higher Education Act by explicitly requiring applicants to submit forms other than the Free Application for Federal Student Aid or by failing to make clear that only the FAFSA is required to be considered for federal student aid,” Cummings said in his letter to Secretary of Education Arne Duncan. The current description of what documents students must submit for financial aid posted on the University's website. 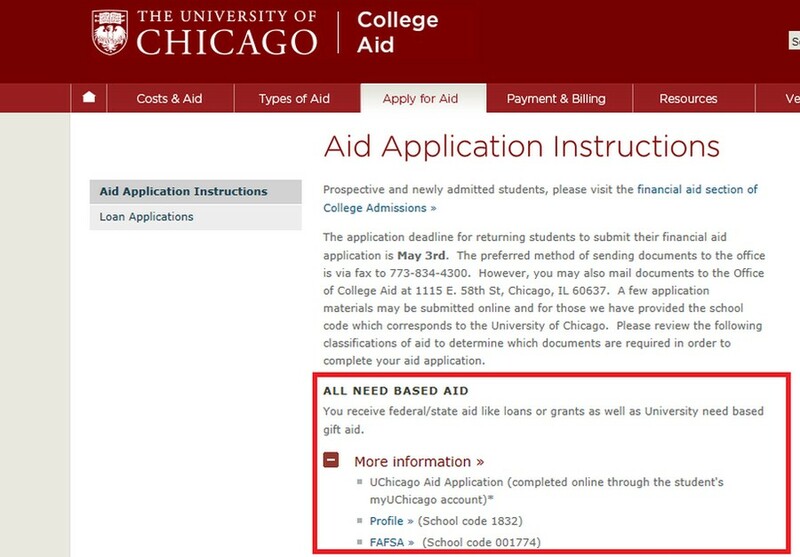 The College Admissions financial aid page was updated in the past week to explicitly state that the FAFSA is the only required form for federal financial aid. It also now clarifies that students who want to apply for both federal and need-based financial aid need to complete both the CSS Profile and the FAFSA. Manier confirmed that the page had been recently updated. The Federal Pell Grant, Federal Supplemental Educational Opportunity Act, Federal Perkins Loan, Federal Stafford Loan, and Federal PLUS Loan for Parents all fall under the category of federal financial aid, according to the Office of College Admissions’ financial aid page. Students were asked whether they had known that the FAFSA was the only requirement for federal aid consideration. “I did the CSS and the FAFSA, but I didn’t know the FAFSA was only required for federal student aid,” first-year Mariyam Siddique said. Second-year Ana Martinez said that she completed both the CSS Profile and FAFSA on her own. “If the University is going to grant aid to students, they have a right to ask for sufficient information. I assumed they needed the CSS and FAFSA because we were required to submit both,” Martinez said. The Higher Education Act is a federal law that “prohibit[s] higher education institutions from using any forms other than the Free Application for Federal Student Aid (FAFSA) to determine eligibility for federal financial aid.” In his letter, Cummings requested a meeting with Duncan to discuss the best ways to ensure that colleges and universities are in “full compliance with the Higher Education Act and are not creating improper and unnecessary barriers” to federal assistance for students.